Gardening is fun…so are chickens. 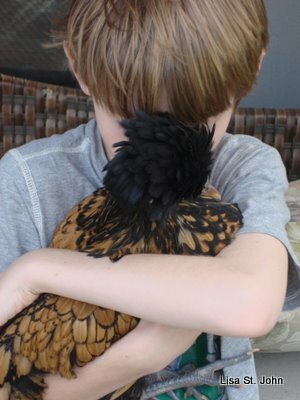 Meet my son Grayson and his favorite hen “Floofy”. Most days you’ll find Grayson deep into a new project. Sometimes it’s a homeschooling project, but most of the time he’s in his garden. His latest project is researching and planning a huge butterfly, bee and hummingbird garden. We have removed the sod and will be planting on Wednesday. Grayson completed a six-week beekeeping course through the Lee County Agricultural Extension office . Now he is a backyard beekeeper and is a member of the Southwest Florida Bee Association. We have 2 boxes of bees. We can’t wait to harvest our honey! Did I mention he is only eight?